The employment picture is really coming into focus, in the context of the shallow industrial recession and inventory correction. 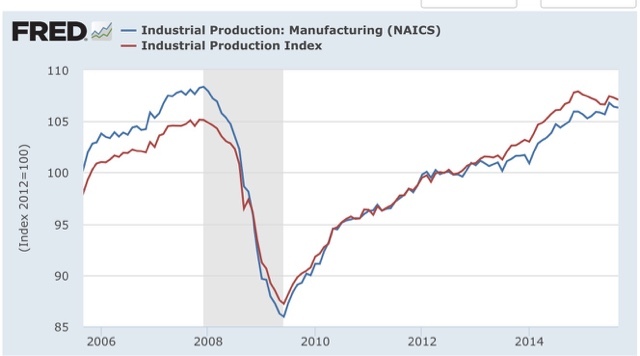 By now I'm sure you know that industrial production not only declined again in September, but has also failed to make a new high in almost a year. I continue to be underwhelmed by the monthly JOLTS reports. Most commentators focus only on the job openings number without paying attention to the pattern of this series during the 2002-07 expansion. As an initial matter, while this series looks extremely useful, because there is only 15 years of history, there is only one complete business cycle with which to compare. 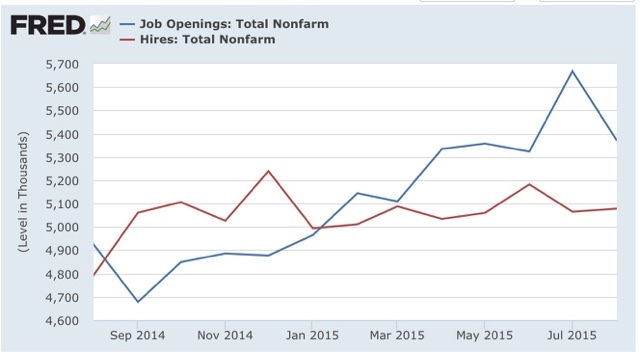 During that cycle, hiring peaked well before job openings. As shown above, the peak in hiring (and the trough in voluntary quits, not shown) was the first signal that the expansion was decelerating. Once again, while job openings have skyrocketed, actual hires have stalled. It is only because August 2014 featured an anomalous decline in hiring that the Hires series has not turned YoY negative. 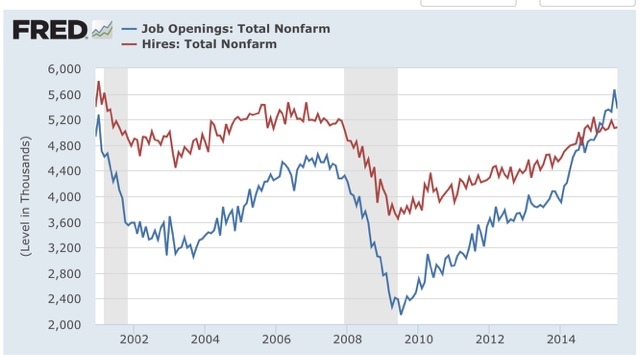 This suggests to me that (1) we are past mid-cycle, as many other series also show; and (2) there is a labor market disconnect, as employers are not filling a record number of openings. As to why those openings are going unfilled, I have seen a fair amount of survey information where employers are complaining of not being able to find appropriately skilled candidates. I suspect that there are one or both of two clauses missing in those sentences, as in: "We are not able to find skilled candidates [for the wage we want to pay and/or because we refuse to pay for any on-the-job training]." Again, this is an underwhelming report, but if the underemployment rate continues to decline, I anticipate that more and more employers will capitulate on increasing wages for new hires. 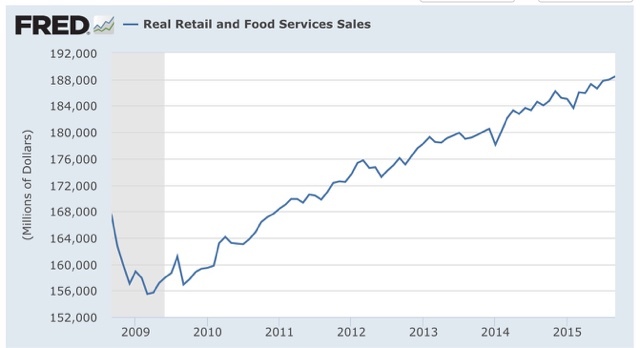 With September inflation reported this morning, I can update one of my favorite series: real retail sales. There is increasing evidence that we are past mid-cycle. 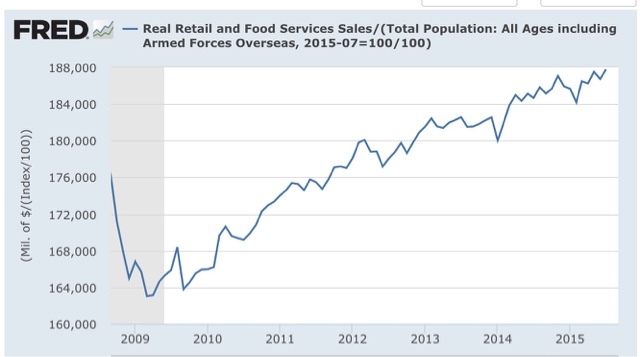 Although population has not been updated past July, since it has been growing at about .06% a month, and since real retail sales are up about .30% in the last two months, we have made another peak. This is evidence that the economic expansion should continue at least through the 3rd quarter of 2016. In my opinion, the single best measure of a labor market expansion is real aggregate wage growth. 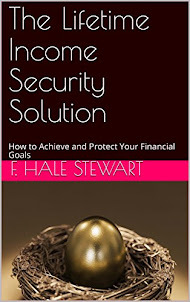 People don't work just for the hours, or the jobs, but for the cold hard cash they can bring home and save and spend. How much a growing economy allows them to do that is the best measure of the well-being it is delivering. I call this the "lump of labor" approach, because sometimes, as in the 1980s and the first part of the 1990s, average wages are declining, but hours are expanding. 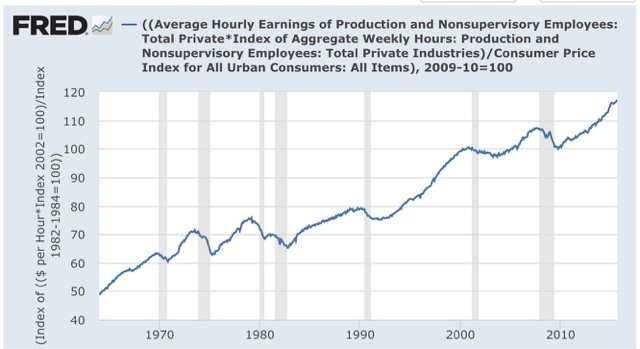 Sometimes, nominal wages are growing, but inflation-adjusted wages falter, as in the 1970s. In the present expansion, by contrast, nominal wages and real wages have grown slowly, and hours worked have grown strongly. The current expansion, as opposed to the expansions of the 1950s and 1970s, also gets bonus points for being long-lived. Real aggregate wages are now 16.8% above their recession trough of October 2009. It is easy to see that this expansion does not measure up to the 1960s and 1990s, but far outpaced the George W. Bush expansion of 2002-07. At this point, 5 years and 11 months after the bottom, the Reagan expansion was slightly better at 18.9%. Note that about half of that increase came during 1983, whereas in the current expansion real aggregate wage growth started out slowly (as gas prices rose from $1.40/gallon to $3.95/gallon) and then picked up steam last year (as gas prices fell to less than $2/gallon). As an aside, *if* real aggregate wage growth were to continue for 12 more months at its average pace for the last 6 years, past history going back 50 years strongly implies the democratic nominee will win the presidential election next year. I have an updated post at XE.com . If corporate profits are a long leading indicator, and stock prices a short leading indicator, then corporate profits should lead stock prices, at least when those prices are averaged quarterly. With Q3 in the books for stock prices, where does this relationship stand? Over the last couple of years, more and more blogs have closed down. Sometimes, it is because the person has too many other obligations. Sometimes, the person has just a few readers, but other great qualities. 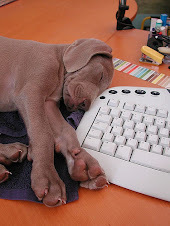 For example, the best political blogroll I ever encountered was at Frank Chow's now-closed blog. Recently he made access to the blog private, so even that is gone. I admit that I too am close to despair. In the first place, the economy has been kind of boring in the last couple of years. At or near mid-cycle, as I have often said. Beyond that, I frequently feel like I am shouting into the vacuum of the Oort cloud at the long-term deterioration I have increasingly seen over my lifetime. 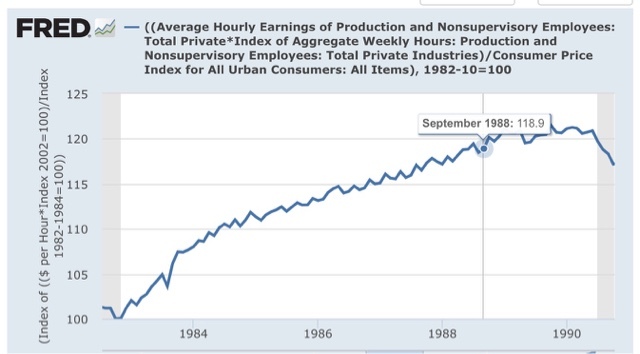 We didn't use to have wage stagnation. We didn't use to have an increasingly desperate middle class. We didn't use to have near-daily mass shootings. We didn't use to have a crumbling infrastructure (I have taken to calling the traffic reports in my area the "failing infrastructure report" because all too often a bridge or a rail line or traffic lights or just congestion that was not planned for is the cause of problems). Worse, the solution from the dominant faction of the Democratic Party is weak-tea rim-shot free-market tweaks. The solution from the GOP is always to double down on the insanity. According to one of the best political books I have ever read, "Whistling Past Dixie," showed, based on reams of polling data, that white working class voters in that region -- unlike such voters in any other region -- treat candidates' positions on "social issues" as a filter. If a candidate does not make it through that screen, their economic positions don't matter. Significantly, the reactionary views in that region coincide with the first major immigration into the region -- of Latinos and relocated Yankees -- in 400 years. The old social order of the descendants of largely Scotch-Irish whites at the top, and the descendants of African slaves beneath them, is being profoundly shaken. Just this morning, I read an article where struggling South Carolinians are interviewed about stagnant wages. They all acknowledge the problem, and are angry about it. Economic despair is a potent political force. . . .
[When] you listen to indignant voters[, d]espite the still nascent recovery, a huge number of people in the middle and lower classes say their wages have not budged in years. The operative definition of insanity. Never mind that since at least 1981 we have gone down this road of increasing wealth at the very top, increases in corporate profits, and Federal *DE*regulation. The results are pretty damn evident if you are not self-blinded. If it were up to me, countercyclical programs would always be in place, ready to be activated in any downturn. A WPA and CCC would always be on the books. Infrastructure projects would always be in the hopper. At 6% unemployment, the projects would automatically be prioritized. At 7% unemployment, the administrative positions in the WPA and CCC would automatically be filled. At 8% unemployment, the workers would be hired and the projects started, at pre-set levels of GDP. The agencies would be automatically wound down as the unemployment rate fell. Similarly, automatic tax breaks, weighted towards consumers, should be in place, taking effect quarterly or at very least annually as unemployment increased, and then automatically and gradually reversed as unemployment decreased again, with an eye towards running a surplus once an economic expansion were well-established. All of which would hardly have been a pipe dream in my youth. One can easily imagine a Lyndon Johnson or a Robert F. Kennedy or one of many other New Deal democrats proposing such a system. But no more, and certainly not with one party dominated by an adamantly opposed Dixie, and the other dominated by an elite of neoliberal milquetoasts. I used to say that politically the US has shifted 1 standard deviation to the right since then. I no longer believe that. The US is now *2* standard deviations to right of where it was 50 years ago. We have a Supreme Court one vote shy of dismantling the 20th Century, and they don't have much respect for the post-Civil War Amendments either. We have a strident minority in the House of Representatives that thinks it would be cool not to pay the bills that they have already incurred on behalf of the US. We had a GOP President who endorsed torture, saturated surveillance that police can access without a search warrant, and tax rates that could not possibly fund the fiscal obligations of the country. We now have a Democratic President who has made all of these positions permanent. These are now bipartisan positions. Johnson and Kennedy would be treated as beyond the pale now. In 2008, a majority of the country was ready for significant change. It got Obamacare and not much else. Instead, Obama co-opted and then defenestrated the netroots Progressive movement. So, 2008 was a "failed turning point," after which, as in 1989 Tiananmen Square, or 1848 Europe, the reactionary elites double down. As bad as things are now for the middle class, the next recession is out there. 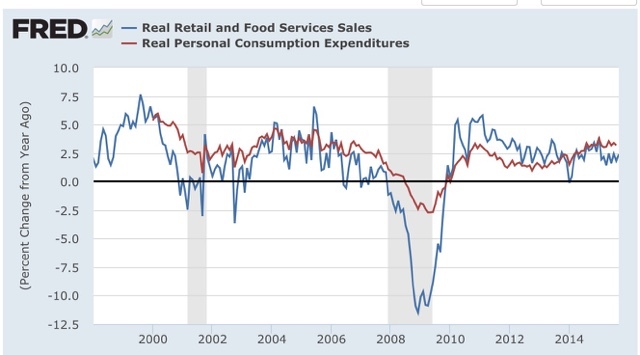 I am terrified that when it comes, wages, which have only been up 2.5% YoY at their very best during this expansion, will go into outright deflation, opening the door to a wage-price deflationary spiral. In other words, unless policies are changed, the next recession is likely to be even worse than the last one. In the meantime, especially if Hillary Clinton is the democratic nominee, the best available choice is going to be more reformist neoliberal nibbling around the edges. That means there is no real chance for economic progress until 2020, and maybe even 2024. And I am not immortal. I think I will die in a US which has turned into a Latin American-style plutocracy, a land of profoundly unequal and stultified opportunity, with no prospect of a turnaround in sight.